So, I have removed the “Purfin M-32” shirt. It was available for sale for 27 hours and there were zero sales. I know that some of you simply planned to buy it later in the week, but I feel that if an entire day has passed with no sales, it must not be a good enough design. I’ll try to have a new one soon. 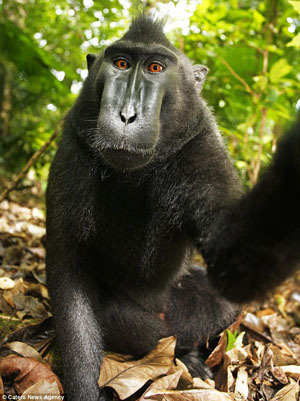 In the exciting news of copyright (as brought to my attention by the amazing Dylan Horrocks), some macaque monkeys took pictures of themselves. For starters, they are adorable! And for finishers, it brings up the question of who owns the copyright? The company who represents the person who owned the camera are claiming, if nothing else: YOU don’t. Ah, it’s a funny world. check out inkoutbreak.com it might give you more exposure, its where i have been reading comics. Due to a lousy internet connection I tend to read comics as they load, so I say the “There’s cake if you want” comment and “He’s lying by the way” comment before I saw who said them. I first assumed it was Dusty claiming Pierrot was lying about the claim of cake, which actually fit really well in the context. @Herandar, you can see he’s taken a few bites. And thanks for the link to the monkey-picture article–that ate up a good half hour of my morning as I read the follow-up articles. Fascinating how the Dusty’s of the world exist in real life too. You know, I’m sort of wondering what it is they are drinking. I don’t think coffee has made it off the Earth yet? Then again, Nogg did mention tea after shanghaiing Martina but, that might have been some bizarre Thelbian tea that is quite tasty for Nogg but deadly poison to humans. @Robert, added! Although I don’t see it on the list, maybe it takes some time to be approved. @Corpore Metal, Well, it’s not coffee. Nogg mentions HERE that Dimitri introduced him to coffee, and I do plan to have that incident written in later on. Maybe it’s never too early for a limbic fizzler? 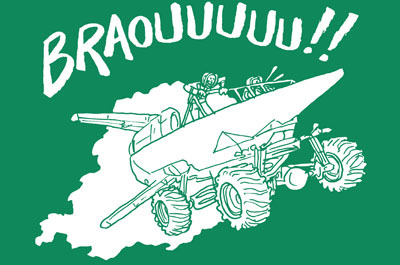 wow, just got suggested this comic…. pretty wild that was fast. 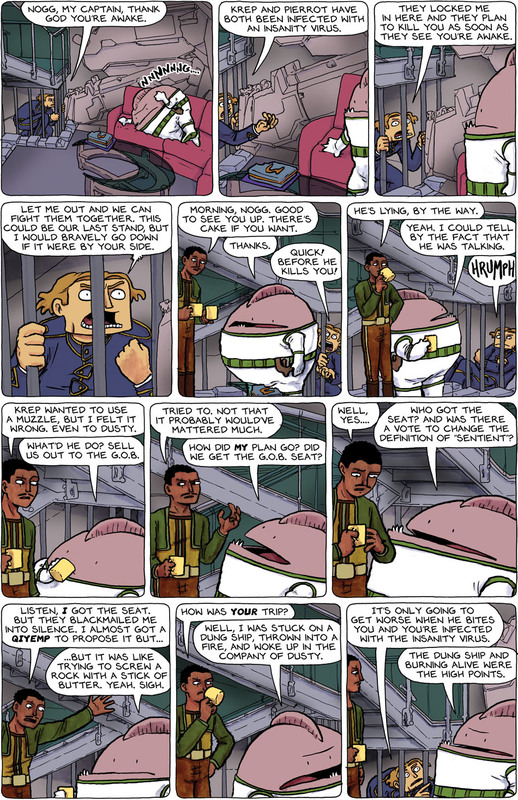 I dont know about approval, but some days i go on and read like 20 comics and later one of the comics i follow is on there so now following spacetrawler! @MYichao: Pierrot took those bites while trying to appease Fiyena. HAH! Dusty gets no love. Thankfully. the fact that Dustin was scheming with the hand gestures makes me skin crawl…. Re the T-shirt: Like the drawing, not the colors. From a distance it’s an odd green with a splash of white. I’d buy a more neutral fabric with full-color bold artwork. The M-32 should practically jump off my chest. I guess it matters less whether the cake has items that humans can digest if it tastes terrible to the pallet. Have you done an Interplanet Amity shirt with just the symbol on it? In reference to the blog post: http://bit.ly/qBdZHA Pulling a shirt after a single day of no sales? Is this wisdom?